Let’s admit it, how many of us go to a ball game and pay attention to every pitch? There are so many distractions these days, between your kielbasa and beer, the extreme graphics on seemingly acre sized HD scoreboards, checking our email and Facebook, or even just hanging out with friends. Yours truly is included with this group. For that reason, 99% of baseball fans would probably make lousy scorekeepers. I was watching the Cubs-Cardinals game Saturday on FOX and the announcers were giving Harold Baines grief because he stopped keeping score after just one inning. And this is someone who is paid to pay attention to what’s going on in the field. My favorite scrorekeeping story was told by Joe Garagiola during an NBC game once in the 70s. He was broadcasting a Yankees game with former pinstriper Phil “Scooter” Rizzuto in 1964. 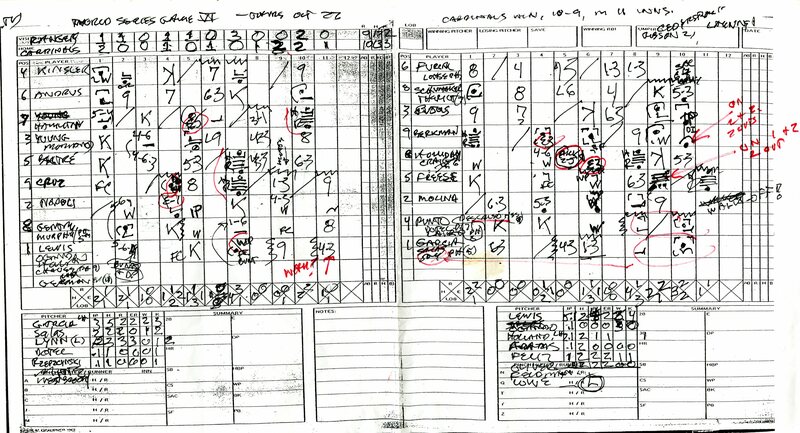 At some point, Garagiola looked down at Rizzuto’s scorecard and saw the notation “WW”. When asked what that was, Rizzuto replied “wasn’t watching.” I remember hearing this story as a kid when Garagiola told it during a game, and I was able to confirm it via email with his son, Joe Garagiola, Jr., who is currently a Sr. VP with Major League Baseball. 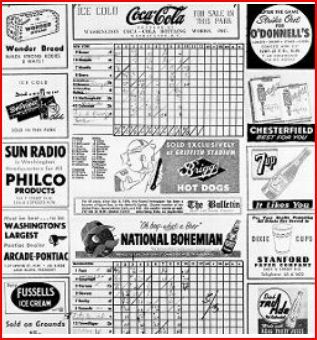 This day in age you won’t find many fans filling out their scorecards. Especially with all the electronics available today, including the MLB app and other apps available for scoring a game. 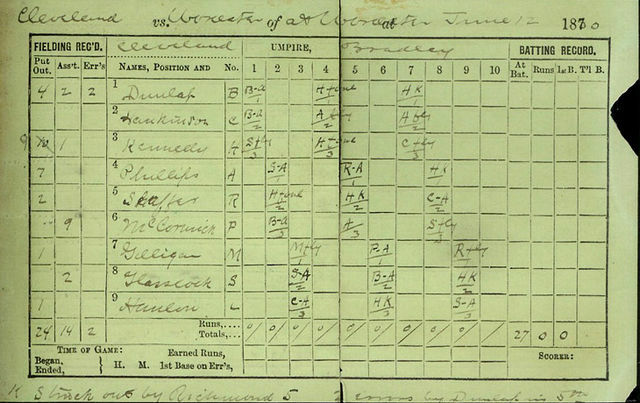 The current format for scoring dates back to sportswriter Henry Chadwick in the 1860s. 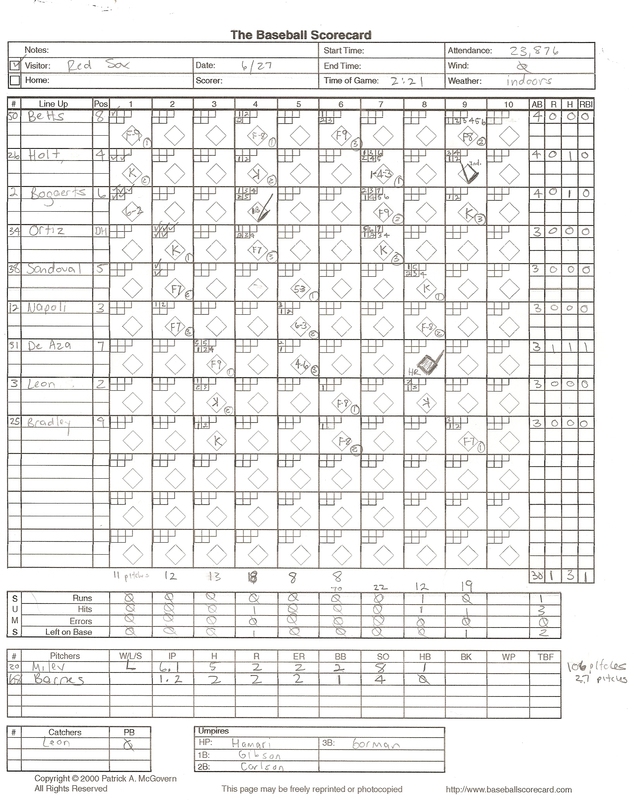 While the general format has remained relatively unchanged, scorekeeping is very personal and can take on various formats. The image above is the scoring of Babe Ruth’s infamous called home run in the World Series against the Cubs. And here are a few other examples. And keep in mind, with the exception of Tim McCarver’s card below, none were with video and instant replay! 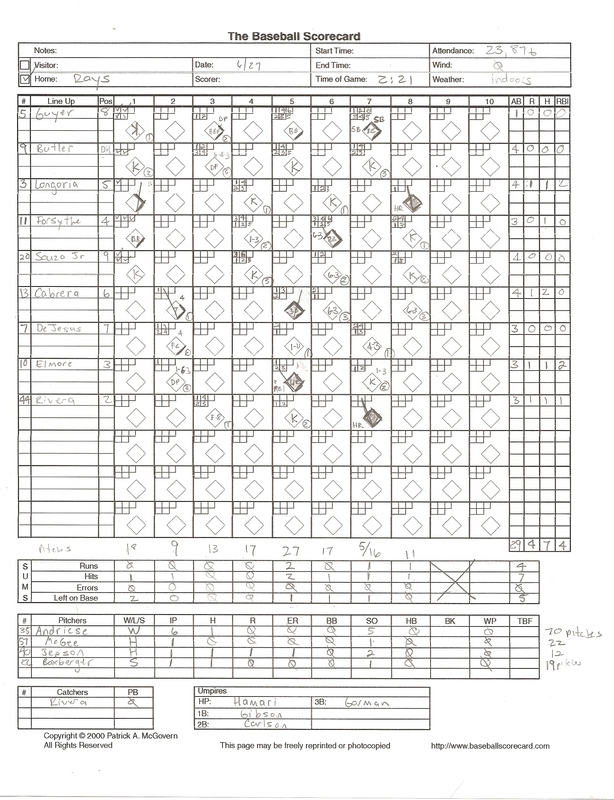 Even with these added benefits, I found it took great concentration to follow and track every pitch of the game. In this game there were 258 pitches. While I was worried that making all the detailed notes of the game would distract me enough that I wouldn’t enjoy the game, that was the furthest thing from the truth. I thoroughly enjoyed it. So, how did I do? Pretty good I think. After entering all of my totals, other than a simple addition mistake, my scorecard and totals matched the final box score, with the only exception being I was off on 1 pitch on the total pitch count. Not bad. The game certainly wasn’t a classic, just a mid season meeting between the Rays and the Red Sox, and it was your run of the mill 4-1 win for the Rays. 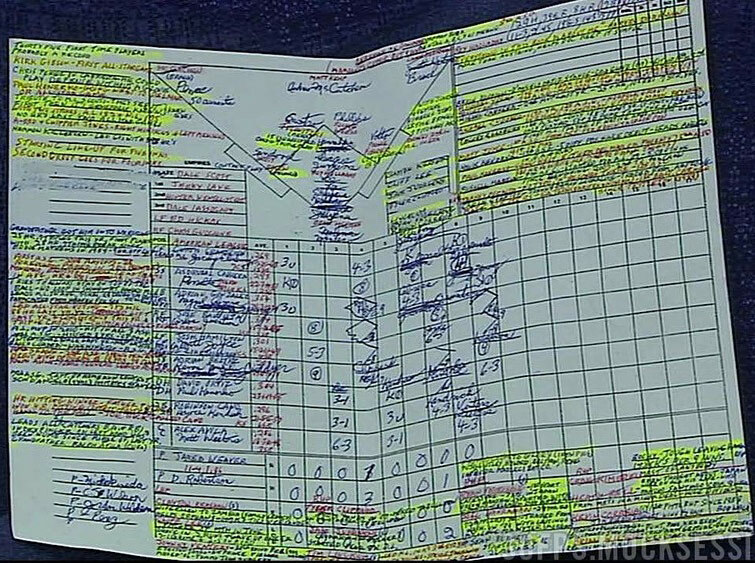 While I doubt that my scorecards will make it into Cooperstown, I’m hanging on to them for a while. My next endeavor might be to score a game while listening to a radio broadcast. I do love a challenge! Keeping score is a lost art! My grandpa used to go to spring training to watch the Tigers quite often. Some of my most prized possessions are his programs that he kept score in. Just seeing his hand-writing keeps his spirit alive.